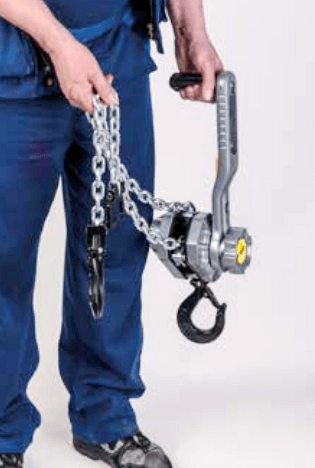 Here is the NEW Ergo 360 Lever Hoist from Yale an innovative lever hoist like no other. 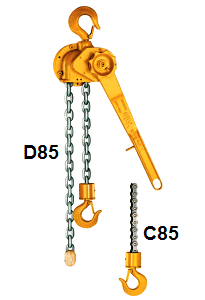 Compact and easy to use with lifting capacities up to 3000kg. 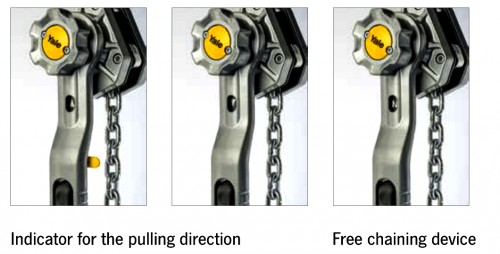 The Yale Ergo 360 lever hoist came about after intensive research into how lever hoists are mostly used. 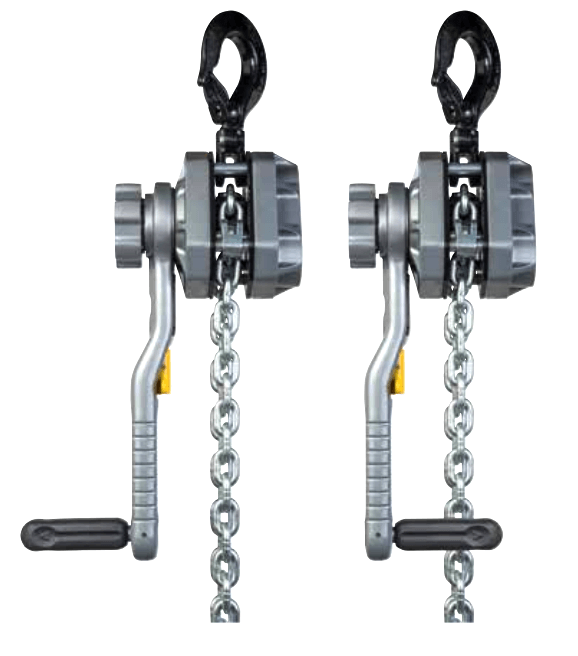 It was discovered that ratchet lever hoists are mostly used for pulling, securing and tensioning applications rather than for lifting tasks. 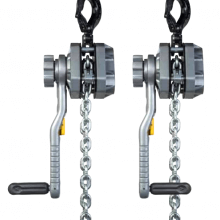 It was also realised that typical lever hoists do not allow proper, safe and ergonomic use in these types of applications. 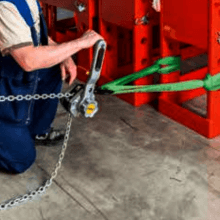 This research resulted in the innovative design of probably the safest lever hoist on the market with a new crank handle with patents pending. 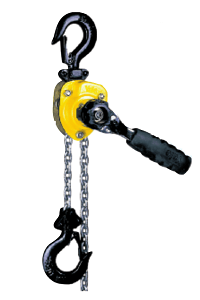 This redefining lever hoist from Yale features the all new crank handle which consists of a unique folding, non-slip handle which can be locked down on either side to enable operation from any angle. 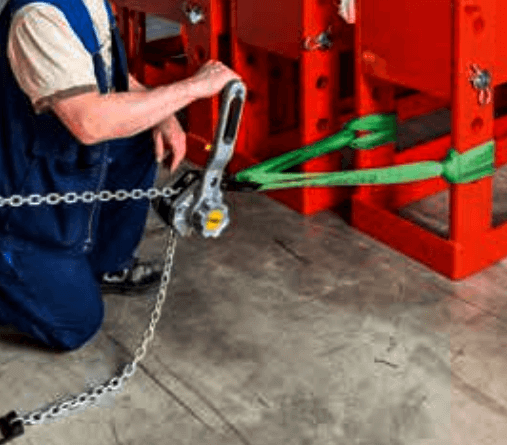 This design feature enables the operator to use it whilst remaining in line with the lever hoist which reduces the risk of the hoist and chain twisting. The handle is able to rotate through a full 360 degrees. This requires much less effort than a conventional lever hoist, up to 30% less in fact! This is due to the high quality bearings and double reduction gearing. It also means that operation is 12 times faster and reduces repetitive wrist movements. The lever is made from heavy duty steel with a durable polyamide crank handle. This handle can also be used for easy one handed carrying. 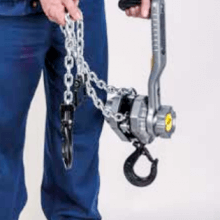 This lever hoist also allows conventional use, as when the lever is in the upright position the hoist can be used like a normal ratchet lever hoist. 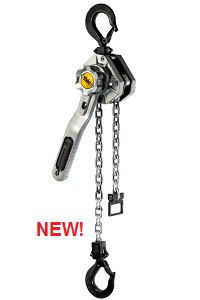 The ratchet handle on this lever hoist incorporates a highly visible and easy to use directional indicator. The indicating arrows clearly shows the direction of operation. Up for lifting, down for lowering and ‘N’ for neutral. The free chaining feature enables quick and smooth take up of any slack chain whilst the design prevents accidental free chaining if loaded. Incorporating end chain stops chain positioning is effortless in free mode and stops it from going into the lift wheel and jamming. Free chaining mode allows the chain to be pulled through in any direction for quick load attachment. The direction indicator should be in the ‘N’ neutral position for free chaining. 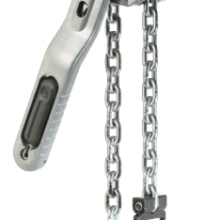 The robust aluminium housing with powder coated finish stands up to heavy use and the chain guide and chain stripper are in zinc plated cast steel for good corrosion protection. The Weston-type brake system is enclosed and so remains clean and dry whilst enabling precise load positioning. 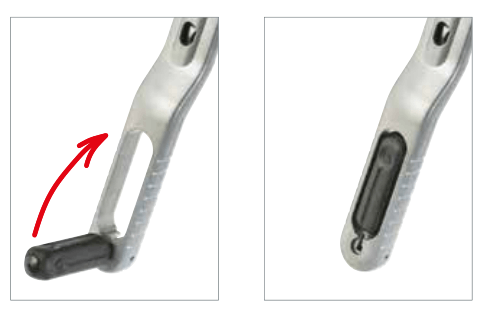 The bolt on hooks have nylon locks for ease of inspections; the hooks are forged and so will yield if overloaded. They incorporate cast safety latches for secure loading. 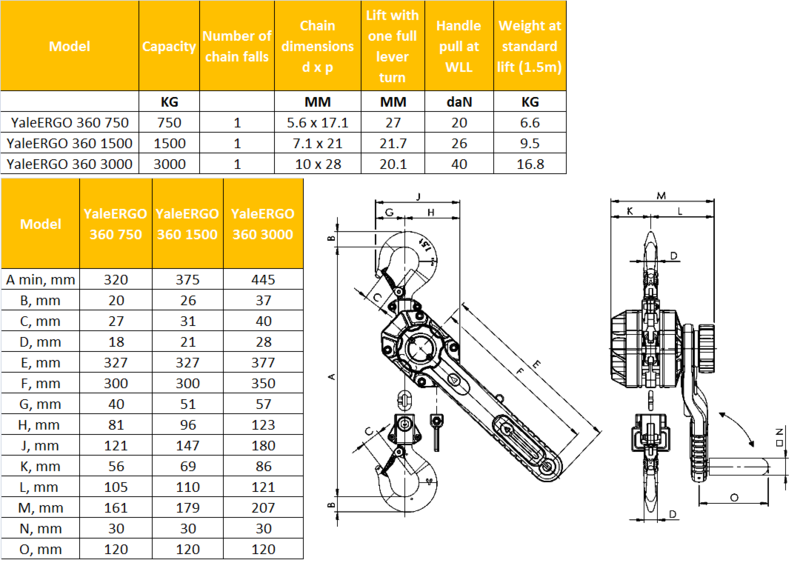 Lifting Hoists Direct can supply the brand new Yale lever hoist with lifting capacities up to 3000kg with 3 optional extras to choose from; an internal load limiter which enables free rotation of the handle in the event of an overload, this prevents damage to the hoist. Radio frequency identification for easier inspection management is available as well as shipyard hooks for the 1500kg model.